Three Russian navigation satellites crashed into the Pacific Ocean Sunday during the launch of a Proton rocket from Kazakhstan. Officials have established a board of inquiry to investigate the cause of the mishap. The Proton rocket blasted off at 1025 GMT (5:25 a.m. EST) from the Baikonur Cosmodrome in Kazakhstan. Live video from the launch showed a normal ascent into a clear early afternoon sky. The Proton's three core stages were supposed to deliver the rocket's Block DM upper stage and three Glonass navigation satellites to space within about 10 minutes of liftoff. 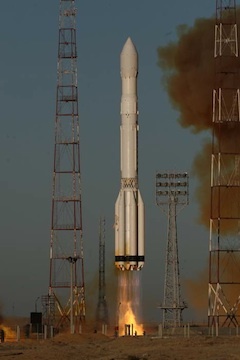 According to Russia's Novosti news agency, the Proton rocket deviated from its course 8 degrees. The outlet quoted an unnamed Russian aerospace industry source as saying the Block DM stage and three payloads crashed into the Pacific Ocean about 1,500 kilometers, or 932 miles, northwest of Honolulu. Khrunichev, the Proton contractor, and the Russian space agency did not disclose any potential cause for the anomaly, although sources say the failure occurred some time around separation of the Proton third stage and ignition of the Block DM engine. "According to telemetry, the spacecraft's cluster was lofted into non-targeted orbit," Khrunichev and Roscosmos said in a joint statement. "Special Board has been established to find out the cause of the contingency and to define next steps." The last failure of a Proton core vehicle was in September 2007, when the rocket's first and second stages did not separate properly, dooming a Japanese commercial communications satellite. The most recent mishap blamed on a Block DM upper stage was a Sea Launch mission in June 2004, in which a commercial payload was placed in a lower-than-planned orbit. The spacecraft overcame the Block DM anomaly, eventually reaching its planned geosynchronous orbit. The Block DM was supposed to fire twice during Friday's launch to inject the three Glonass satellites in orbit 12,000 miles above Earth with an inclination of about 65 degrees. The next Proton launch is scheduled for Dec. 19 on a commercial flight under the auspices of International Launch Services. What effect Sunday's failure will have on upcoming Proton missions is unclear. Each Glonass M satellite weighs about 3,000 pounds at launch, including maneuvering fuel to maintan the craft's orientation in space. The modernized Glonass M spacecraft are designed to operate for seven years in orbit, according to their manufacturer, Information Satellite Systems Reshetnev Co.
Glonass satellites broadcast navigation signals to military and civilian users from their orbital perch, reaching ground receivers across a swath of Earth nearly stretching from pole to pole. Scattered in three orbital groups, the Glonass constellation currently includes 26 satellites, including two spares and four spacecraft listed in maintenance, according a Russian space agency website. An upgraded Glonass K satellite is due for launch on a Soyuz rocket in late December. The new generation of Glonass spacecraft feature lighter weights and longer lifetimes.